My law practice has been taking me to Las Vegas of all places over the last few months. With two cases, one in federal and one in state Nevada Courts I have to physically appear before a judge from time to time. The trips are usually as short as reasonably possible. We arrive, stay at a hotel, do what we came to do and leave soon after. My co-counsel rents a car at the airport and usually takes us to our destination. While I do have cousins in Vegas I usually don't get them involved. I'm there to do work, not to have fun or spend time with family and I need to keep it professional. Also, this is the time I'm paid to devote to a case. Our interaction with the actual city is kept to a minimum. What I didn't know- is how Las Vegas - known for being tourist orientated- prides itself on being disability friendly. If this is widely advertised I have certainly missed the memo - and visitors in wheelchairs like myself should be certainly made aware that they can easily get around by grabbing a cab off the street. Granted, I never had to get one before, so I never considered it as a form of transportation, so perhaps this is not a new thing- but considered me impressed. There's a first time for everything, right? Here's what happened: As my co-counsel and I were arriving from different parts of Florida, her flight was three hours+ later than mine. What we haven't caught in time was, that as we used different airlines, we'd fly into different terminals as well. Although she asked me to wait for her in the passenger pick up area, we did not expect that getting the car from the agency would take another two hours as well. The heavy luggage on my lap made me slow and pretty immobile, so I was just focused on getting to the place where she could find me. I was cold, as the temperature was below freezing, but determined - as she was texting me updates. Then she told me it would take even longer and I should consider taking a taxi. How would I do that, I thought, I wouldn't even know where to start finding accessible transport. I can't easily move back with that extremely heavy bag on my lap. At first I thought, I'd soldier on. I wasn't comfortable, but I felt I should just wait. I considered every move against how much of a bother it would be. One of the wheelchair pushers saw me on his way back and asked me if I needed anything. I told him I needed a taxi. No problem, he said. Turns out wheelchair accessible taxis drive around town like regular cabs, he just needed to flag one down for me. Two minutes later I was getting loaded up. It had a ramp and a bit of a pit in the back so I was seated at an angle. And it was all that he needed to do. No ordering of a service or calling anyone in advance. No bother. The staff at Tropicana, which is one of the older casinos was also very professional. They helped me out of the cab and to my room with my bag. Everyone made me feel at ease. I worried for nothing- and when you have to have to sit around, thinking about what it's gonna be like it can ruin the entire experience. Now I know I have options. And it makes me feel empowered. It makes sense. Vegas main industry is gambling and tourism. It's about making people come, explore, stay and return. And part of that mission is making people with disabilities welcome as well. Childhood disability in the public eye. Full disclosure: "A League of their Own" is one of my favorite movies. Actress and TV personality Rosie O'Donnell has caused quite a stir a few days ago by suggesting that Donald Trump's youngest sun may have autism. She later defended her comments by saying that Barron Trump's high profile would bring attention to the issue. Here's what I don't like about this: he is only ten years old. Nobody should be made the face of anything at such an early age, and no person should ever be "outed" as anything against their will. Even if true- and again- the boy has been thrown into the public eye without having any say in the matter- it will be up to the incoming first couple to reveal any information about him. And even with that- we need to remember that his take on it might be different than his parents, and ten years down the line he might not appreciate the exposure. Here's one thing I will say as someone who grew up with Cerebral Palsy, a pretty visible condition, with very loving parents who were also determined advocates. My mom and dad always identified with my well being and my perspective. But my perspective and theirs was not exactly the same. I know it's very easy to confuse when you are so intertwined with someone it feels like you may be one but you are not. The choices that they made for me were not always my choices, and the consequences they have accepted on my behalf where not always the choices I would have. And this is something that I always think about when saying celebrities featuring their children so willingly and talking about their issues. Disabilities and medical issues are private concerns. Few years ago I wrote about how angry I was when a drunk woman pointed at my wheelchair as I was rolling by and said "I know what you have! It's Cerebral Palsy" She followed up with, "It's OK, I'm a doctor". I don't care who she was. She had no business being in my business. Earlier, I've written about my friend who went to great extremes to hide the fact she was bipolar. Because she had the right to control that information. To live her life as she chose to as much as possible. Rosie O'Donnell should understand that as much as anybody. Disabilities are stigmatizing. You don't start a discussion by blowing up somebody else's life, just expose it for anyone to view. You lay the groundwork, you let them come to this decision. Any discussion about Barron Trump should start and end with- he is ten years old. And if the Trump family is really facing any of these issues, maybe it's an area where Mr Trump and Ms. O'Donnell put their differences aside and work together. I know that this is something that people do- my dad would also point out some people on the street when I was growing up with neuromotor symptoms, but I felt it was just so easy to jump to conclusions. And again- none of our concern. So much is being said about bullying. And yet, it's easy to gang up on a ten year old boy, who may or may not have something none of us is entitled to know about. And he goes against grown people with a platform. Adults who should know better. Didn't we feel that commenting on Secretary Clinton's alleged Parkinson's, a grown woman, a politician and an issue relevant to her ability to govern was also out of line? If Ms O'Donnell has interest in approaching disability awareness the kinder way, she is always welcome at Florida Disability Access and Awareness Foundation and so is the Trump family. Let's not tear into each other. No problems can be solved that way. Every grand idea needs a team. Nonprofits are about a mission. A vision. A narrative. A story. The world not as it it is, but as it needs to be. When I started the Florida Disability Access and Awareness Foundation, I've said that while it's about the types of issues I know full well and face every day, it's not really about me alone or any one individual. It's about the shared understanding we developed within our Board of Directors over the last three years and all the volunteers that have since came and left. An understanding that needs to survive on its own, even after I'm no longer involved and can stand on its own merit. All of us wanted to share our values and hoped our passion would spread like wildfire. We chose to develop media and technology projects to change perceptions and deal with disability prejudice and stereotypes. Nothing is more powerful than visuals, movies and TV shape attitudes and no medium is more interactive than a video game. But to me, what we develop is almost as important as how. I wanted to find a way to harvest the energy of the younger generation for greater good, to get them excited, to get them riled up, but also to give them a creative outlet and to teach them as we move along. Yes, the opportunity to work on real projects that touch upon real issues is very exciting. But I'm more excited about the education experience and spreading disability empathy that comes with it. Because perhaps we don't have to educate society as much and change perceptions later on, if we raise a caring responsive, empathetic youth. Give them the perception they can internalize and take on. I'm very excited that Florida Disability Access and Awareness Foundation has a sister student group at the University of Florida, FDAAF Gators. Our students can work on projects that matter to them, but also volunteer and intern and even be in charge of the projects our nonprofit is developing. It's all pretty new, but I think giving them a structure and one that is in many ways separate from our charity helps meet all our goal. We were very lucky to find a passionate student, Brooke Kaplan who wants to make a difference, and an advisor, Beth Roland who is our campus connection and knows how to talk to and motivate students. For us it is crucial that the club has a direction and positive energy. It's part of our philosophy to get students to do more than just make coffee at a nonprofit, but to actually work on and drive real projects for real change. In that way FDAAF Gators has a chance to be unlike all those groups that people move on from and forget about. I hope to us is the first of many student communities with FDAAF branding. Every school should get one, as we always look to expand our team. But this is our call to other nonprofits. If you're near a school develop a campus presence. Find creative ways to get students involved. It not only legitimizes you, but it opens up so many different avenues for expansion and growth. Seeing this made us proud: https://ufl.collegiatelink.net/organization/fdaafgators. The Clinton Foundation has just made it more difficult for all of us in the non profit sector. For me- the issue is not about politics. It's not about who you plan to vote for, and if you love or detest the Democratic nominee. I also want to save the debate on whether or not it's ethical for any institution to take money from foreign governments that throw gays off buildings and don't allow women to drive for another day, and what kind of expectation is tied to a multi million dollar donation to a charity spearheaded by an influential politician. Those of us in the non profit sector spend many years developing our main asset: reputation and the major currency- public trust. It takes time to convince donors that we use their money wisely, that we're transparent, that we have a goal we're passionate about that they should get behind and believe in and that we are not wasteful. The controversies that surround the Clinton Foundation reinforce some of the worst stereotypes about how big charities run and what they do. From excessive salaries, meetings with US administration and preferential treatment,jets flights and private travel, every week Wikileaks serves us a new batch of foundation related scandal. It's bad enough if those are simply accusations, it's so much worse if any of it it's true. My biggest problem is - that we are all viewed as one industry, although we do different things and often don't even have much to do with one another. The Clinton Foundation soap opera might not be causing much outrage because it reinforces what people often think of non profits already- that although the might not know how and why exactly - something fishy is going on and it's most likely a scam. A bias like that is very difficult to counter. How can I prove to you that I have good intentions? When I launched my nonprofit, Florida Disability Access and Awareness Foundation I started writing about its mission with excitement on social media. I remember being attacked by strangers on Facebook, saying that it has to be some elaborate scheme to line someone's pocket. My foundation was also accused of using "a picture of a child" to promote it's "shady mission". The picture was me in a wheelchair. I just happen to have a youthful appearance. The person was some sort of a nonprofit vigilante who took upon himself to track and target organizations he didn't think were worthy. These are the types of reactions we have to deal with. and many of those grass roots nonprofits like mine don't have access to Wall Street, investors and bankers. I must say, when I read of a million dollar gift to Bill Clinton or $250,000 speeches I think of the projects I have going on that I can't even get the $600,000 budget for. a project we are now developing All I can do is tell you my story. How I started a nonprofit because I was tired of how society viewed the disability community and I wanted to do something about it. That my goal is to develop media projects and videogames and apps- by people with disabilities, about people with disabilities and for people with disabilities. I also want to teach veterans and other people with struggles how to code and produce, giving them a chance to compete in that industry. It's a shame- The Clinton Foundation for many years seemed to be the gold standard for non profits and many of my friends devoted a lot of their time and effort to help with the Haiti projects and really believed in it. Every time a controversy like this happens- people believe less. Care less, trust less and want to help less. And so we all suffer. How do we recover? For me it's focusing on the positive. On the passion that I have, on the conviction that I can make a difference. Some of us actually want to do good things. "Change" is more than just a slogan. I can show you what I'm doing and I can tell you why. Cocktail parties with the DC elite couldn't be further from what we are doing. But we rely on every dollar and really appreciate all the help. What I hope for - is that people realize that there are countless nonprofits doing the good work every day. And that yet another scandal won't cut off support for those of us that are not in the spotlight, or are connected to big money in any way. And this is the job we will be doing Wednesday morning, come Clinton or Trump. In the meantime, please visit our website at http://fdaaf.org and let's work together! My Facebook wall continues to be a heated place for debates as Presidential elections are approaching. Many of my friends expect me to strongly come out against Donald Trump, and yet I continuously refuse to do so. Every few days someone posts an article about he or his businesses tried to avoid or supposedly violated the Americans with Disabilities Act. Their take, of course is: that I have a disability nonprofit, that I have a disability myself having spent my entire life in a wheelchair, so my position should be strong and firm. What they don't remember- or perhaps never knew is the reason why I started a non profit in the first place. I took on this mission precisely because it the positions that are attributed to Mr.Trump and his industries are not new and unique to him. They are shared pretty much across the business community. While to me the ADA is something that fuels my empowerment and secures my inclusion, to a business it is not simply an expense, it is a burden. I started the Florida Disability Access and Awareness Foundation to build some form of understanding for the law, what it does and what it's trying to accomplish. Many business owners have shared with me privately, that accommodations are costly, time and room consuming and that they have to do what they feel is right for the bottom line. And I said multiple times, that while on some of those things they could be reported, fined or even sued, I didn't want to be the person who shuts business down or gets them in trouble. Instead, I want to educate them, change how the think, get them to understand what it's like to be somebody like me. That's why I started FDAAF: to show people that the ADA is not some abstract requirement, but something that affects people's lives. Because if we don't see the overall benefit of having those solutions in place, we will always find ways to get around it. To single out Donald Trump would be deeply unfair, even if allegations are true. I've seen dozens of ADA inaccessible places in Gainesville, where I live or looking for a technicality allowing them not to comply. Rather than yelling and threatening owners with legal actions I want to help them to grow and to understand. You always needs to see issues from both sides, besides - I have always said, just like the establishments around me- I'm part of my community. I live here. If they blossom, we all blossom together. And to have someone come around and gain a better understanding of a reason behind a measure is- I think, more meaningful that having them comply with a requirement. There are many points you can take away from the Martin Shrkreli media circus. You can talk about ethics and business and human nature. How after decades, centuries even of being conditioned that success should be the ultimate goal - and that being inventive and prosperous is a good thing- we are suddenly talking about drawing a line. How we are seeing that all of the sudden, some industries are different than others, although all businesses take time, money and involve risks to develop. We could discuss who should make those calls, where those lines are and if putting in some hard regulations can have a chilling effect on an entire industry. And how on the other end preventing people from identifying and jumping on an opportunity can shut down not only the stream of fresh capital, but also ideas and energy into it. Here's what I do know: most of us want to do business, succeed and prosper, but also feel good about ourselves and what we do at the end of the day. What's fascinating to me about Martin Shkreli- as I try not to have an opinion about the man himself or what he does as I never met him nor am I his priest- is how little he seems to care about what people think of him. So here's the big question: Is the media interest in him fueled by the fact that he has done something so outrageous that there's no return from it, or is it that he refuses to play by the rules? He draws attention to himself of course and he doesn't help his case by being defiant. He's dismissive, he's making faces. But is the reason for his overnight celebrity status the actual, underlying controversy or how he goes about it. Has business men never done worse? Have we just not heard about it? Or do we really want to start looking under the hood of every business in America? Because then I think we should brace ourselves for what we might find and that won't be pretty. The thing about Martin Shkreli is that he hasn't launched his big media apology tour, and I don't think he will anytime soon. He hasn't cried on Oprah's couch yet or danced with Ellen, nor told us a moving tale from his childhood. He hasn't planted a tree, shook hands with Al Sharpton, nor no A-list celebrity came out to say that at his core, he's a great guy. There's no scholarship in his name. And I think the most important aspect of this story is the media portrayal of him rather than what he has actually done. And how refuses to follow a well established path to redemption. Because everybody does it. And note, we never know what the content of their character is, if they are ever sincere, but we do expect that they keep up appearances and they make appearances, because at the very least we want them to at least act like they care. To appease the media, that will then put their stamp of approval. The thing about Shkreli that pops up to me transcends the ideas of good or bad. He's defiant. He chooses to go overboard to make a point. I think he might be making a mistake, because he will need those people as he makes his way up again. But he's story really made me think- that if he wanted to- he could have cut the prices of his drug in half the day after, and although it still would have been prohibitively more expensive then three days before, he would have still been introduced as a great humanitarian. And I don't think any of the outrage would have actually happened had he been quieter, more responsive and respectful. Even if all the substantial facts were still the same. So then, I thought the controversy is not really about his actions, the actual pricing story or the SEC controversy, but his defiance. I really believe that but for his defiance, not of this circus would happen. He might be an awful person, I don't know and I don't care- but I don't think it's the reason for the interest in him. It's that refuses to play along and exposes something about the 24 hour news cycle. And if he wants to, he can donate to my nonprofit, Florida Disability Access and Awareness Foundation (http://fdaaf.org) and I'll shake hands with him. But I don't think he will . I have a lot of exciting things to write about. I'm doing plenty of work for other people and our Foundation seems to be finally going places. But please- let me use this Monday to talk about the weather. I know, I've used it for sentimental reasons in the past- to talk about missing my home and family, to vent or to just fill the empty space. But the American weather has been making headlines lately. There are snow storms in New York and DC, curfews and travel bans. Nothing that severe in Florida, but there was a tornado warning a few days ago. And it's been cold. Really cold and for a few weeks now. I'm a bit to the north, so we might get a bit cooler up here than Miami, but I've never seen anything that severe. We've had days where (excuse me for using Celsius as Fahrenheit still means nothing to me) where the temperature would be as low as 6 during the day and -3 at night- and it happens now day after day. Usually, we go up into the low/mid 20's during the day (maybe a bit lower in the winter days like 16?) and 13 in the evening is a cold night. At first I was glad. It's going to kill the mosquitoes, I thought. They're quite a problem in my warm and wet part f the State that is called "Swamp" for a reason. It's been cold every day for a while and I seem to have only a pair of thicker pants and a winter jacket. I know I'm Polish and I'm supposed to not mind the cold, and it's not the temperatures really, but this Arctic wind that chills you to the bone. Snow was spotted in Gainesville this week, not much, just flurries, but for some of my friends it was the first time in their lifetime. It's not a nice winter. It's just not pleasant. The one thing I've always loved about Florida- the bright sunlight that illuminates everything, giving all colors this amazing clarity and hue like a 3D rendering that I never could describe is gone. Trees wither. Leaves turn to shades you don't see here. I've discovered my apartment is not well isolated. It really feels like the end of the world these days. At first it seemed like fun to switch up the routine a bit - stay at home- finish work, give my Tassimo the run for its money, watch some Netflix. Order pizza. But now I'm ready for Spring. It's 21C Monday before it gets cold again.Welcome to Florida, 2016. Here's what I've been seeing more and more lately: legal work requests popping up on freelancer websites like Upwork and Outsource. A lot of those online "jobs" are picked up by people who are most often not even lawyers, but writers and content editors. Some are legal professionals from remote locations like India or the Middle East who are not licensed and therefore not permitted to give legal advice in American jurisdictions. But they are cheap and they work quickly. In the age of the internet, Clients have their own idea of what a lawyer should provide, what it should look like and how fast. Quality is almost secondary. They order a contract the same way they order a logo and expect results. Of course, the consequences of getting a contact wrong are far more dire than a logo or a website you don't like. At the end of the day it's lawyers like me who deal with contracts where the drafter missed an issue or left an ambiguously phrased term. And that costs a lot more than spending a few more dollars on a properly written document that is clear, thought out, anticipates many of the concerns that would otherwise have to be figured out in litigation. Not to long ago I saw a contract that used a phrase "arrange for transport". Both parties were happy with it. One thought they have fully performed by presenting the thing in question to the transportation company. The other believed they were contracting to have the thing transported from A to B. But it was short- it was only one page and some people find that appealing. An issue like this would be resolved by looking at the history of the parties' communication, to figure out what their intention was. And that takes time and money. A better phrased sentence would have taken care of that and everyone would have known where they are. But a lawyer didn't write it. And you know that one will get involved and have it sorted out eventually. Let's take the issue of non licensed lawyers or non-lawyers practicing law, which many if not all American jurisdictions criminalize, out of it for a minute. Or that if something goes wrong- they'll be nowhere to be found. What I find concerning is how those clients make specific requests as to the length and structure of a Contract - because I guess they're used to control anything else. There are ads like "One-page contract in 36 hours" - as if its purpose and function are completely secondary - and a Contract was a completely generic, interchangeable piece of writing- like a form. I was trained to write clear, easy to follow documents understandable to a lay person. They need to be well edited and structured, with issues properly grouped. And a contract needs to be reasonably short. But I advise against one page contracts. It needs to be as long as it takes to flesh out all the issues. My rules of construction typically take 3/4 of a page. And those are things you shouldn't really go without. Does your contract have a severability clause? Governing law? Jurisdiction? Attorney's fees? The truth about Contracts is that what you don't put in- can hurt you. You can do it fast and short and pray it will stick or you can do it well and be proud of your work. My law school started a mandatory drafting course because there was so much bad writing in the nation they had to address it. And it made us think about words. How they have power and meaning. Drafting all of the sudden became a responsibility. We live in the age of the internet. Expect a lot more bad drafting and a lot more litigation. Many people don't believe it when I say it. I really don't have big dreams for myself. There's no gadget that I really must have, I never wanted a mansion and fast cars don't really impress me. I just want to be comfortable. For me that means being in a place where I don't have to wonder if I see enough clients this month to pay my rent. And quite frankly I'm not there yet. I have my moments of stress and my moments of doubt. But for me life is about being able to make it. And having a life doing what you know well and love. Helping people. Being surrounded by friends. Searching for and finding happiness. Perhaps it's because I devoted so much time and energy to the non profit that I started, Florida Disability Access and Awareness Foundation - but making it work, making a difference in how people see disabilities is my one big dream. And I know that if I can finally have that rolling, everything else will fall into place. And it just has to happen. If I won a million dollars- I'd donate it back to the Foundation. In my mind I can see all the great programs we could launch with money like that and people that it would have touched. The vision that is so clear to me I can picture my future team and it's office. excited to get started. Sometimes I just don't communicate it well. We can get America to care about disabilities, to notice, we can push, we can inspire and listen. For me it starts in Florida, but that's just the beginning. 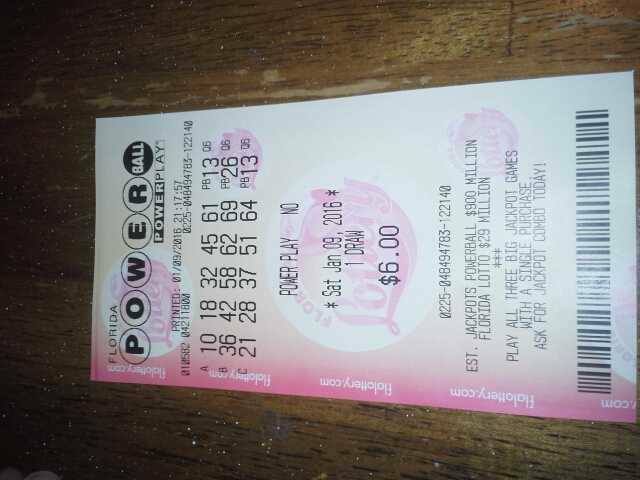 Yes, if I won the billion plus this coming Wednesday I'd take care of my family a little more ( my dad does have a heart condition) but the closest I've come to thinking about spending money on myself is moving to a bigger apartment, only across the street. My fantasy is not retiring by 40 or a cruise on the Nile, but leaving this world a little better than it was when I found it. Perhaps it's because being in a wheelchair all my life meant that proving my worth was always a goal in the back of my mind- but what I want to do can help a lot of people. A lot of people like me. And you can help to, by visiting. http://fdaaf.org and donating what you can. And I did win Saturday, and not metaphorically. I got 8 dollars! And I get to tell the tale how I participated in this historic lottery with the biggest jackpot ever. 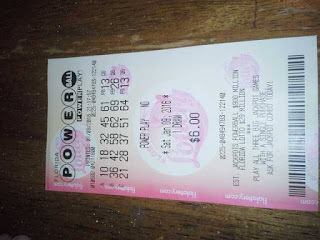 I was there even if I don't win the 1.3 billion. And hey, it's for education. Here's one aspect of the gun laws debate I admit I never thought of. After the San Bernardino shooting, one of my directors pointed out that the place that the terrorist couple opened fire was a center for people with disabilities. I don't remember this fact being particularly advertised in the media. "They're like sitting ducks"- she said, pointing out that nobody there had any means to defend themselves and everyone was at the mercy of the killers. Wow, I thought- if there was ever a better illustration of how powerless your disability can render you. I've said time and time again that people should have guns if it makes them feel safer, that I feel safer if a trained and qualified gun user is around me, but that I would personally never get a gun because I'd fear I hurt myself. I tense up easily and I practically have only one functioning hand. I know guns are not a popular subject for a lot of people and I debated even bringing this topic up in my writings. My Board Member then told me that she would take me to a shooting range and that I needed to learn. I don't need to buy a gun- or have one she said, but I need to learn how to use it. In an emergency, if a gun or a clip fell to the ground would I know how to pick it up and use it, reload it if I needed to, switch the safety off. This is a touchy subject for a lot of people, but I do see the value of knowing how to handle something that people use and handle for their safety, that is broadly available even if I don't have one myself. Educating myself can save my life and ignorance can surely kill me. So I did try to contact someone at the NRA with only one question: Do they offer any training courses for people with physical disabilities or know someone who does. Not to promote gun use, but to promote knowledge. And the more we talked about it - with that co-worker of mine, the more I realized that people with disabilities would not only require special holsters or other ways to carry it, but a host of specialized accessories. I thought about whether it would be appropriate to approach this problem as a the Foundation. I'm sure such work would alienate a lot of potential donors. But I really want to know what is out there. And what is being done to keep people with disabilities safe. I know I might take some heat for this, but I can even see some therapeutic value to owning and having a gun. We're talking about people who often feel deprived of something or limited. Getting the power to defend themselves back seems like confidence booster, reclaiming some control and normalcy. But it's not for everyone. Most likely it's not for me. But I'd like to now more. And everyone likes to have options. But that's the point: I created the Florida Disability Access and Awareness Foundation to talk about issues and aspects relating to mobility and disability perception that no one has before. And I look forward to work with a broad rage of partners, varying from issue to issue to push the discussions further. For now visit http://fdaaf.org and get to know our vision. It's a New Year and for us at the Florida Disability Access and Awareness Foundation- an anniversary. We formed the nonprofit in January 2013. And it feels like every January we come back from the Christmas celebration with a new vision and a renewed sense of mission. Last year around this time we got our 501(c)(3) determination. This time we have a clearer idea of where we are and we deal with better articulated projects. We want to work with businesses. We have an idea for a one-stop disability resource portal and we want to pursue our wheelchaired for a day video project and develop inspiring tales of regular people dealing with inaccessible cities into a full fledged documentary series. But it's also time to start over. To regroup. To recruit new blood. This time we're reaching out to journalism, computer science, marketing and architecture students, all majors relevant to what we're trying to build. We are able to satisfy a community service requirement or a volunteer coursework credit. We'll even consider structuring an internship. Because we need help to move our matters along while students could really benefit from working with a living breathing nonprofit and interacting with disability issues, up close. Santa Fe? UF? No problem. Please review the following postings: Videographer PR Coordinator Marketing Copywriter and join us!